A favorite Hawaiian way to eat Spam is in the form of a musubi (pronounced moo-soo-bee, with no accent). It is a fried slice of spam on rice pressed together to form a small block, then wrapped with a strip of seaweed. The Spam musubi is eaten as a sandwich, and it is perhaps the Island’s favorite “to go” or snack food. Spam musubi is literally everywhere in Hawaii, including local convenience stores, grocery stores, school cafeterias, and even at the zoo. Eating a Spam musubi seems to serve as a rite of passage for newcomers anxious to attain “local” status. A special kitchen gadget, known as the Spam Musubi Press (see photo below), is responsible for the proliferation of this treat. It is a special plexiglas mold with the outline of a single Spam slice. Hawaiians have a love affair with Spam – they eat it as a delicacy, adding it to soups and stews, treating it as a side dish for breakfast, and enjoying it as the main event for lunch and dinner. Residents of Hawaii consume more Spam than populations anywhere else in the world: More than four million cans every year, or an average twelve cans of Spam per person per year. 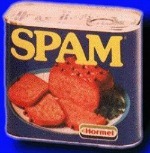 In fact, Hawaii is so well associated with Spam that Hormel even introduced a limited edition “Hawaii can in 2003. The Hormel Company, in Austin, Minnesota, developed America’s first canned ham in 1926. After the hams were cut, the company was left with thousands of pounds of nearly worthless pork shoulder. Jay C. Hormel, son of Hormel founder George A. Hormel, developed the ideas of using the pork shoulder in a new product called “Hormel Spiced Ham. Since the name was rather uninspiring, a contest was held at a new year’s Eve party for a new name with a $100 prize to the winner. The winning name was the name it goes by today – Spam. Kenneth Daigneau, an actor and the brother of a Hormel vice president Ralph Daigeau, won the contest. During World War II, sales of Spam soared. In part because it requires no refrigeration, Spam was perfect for the military and became a standard K-ration for U.S. soldiers. Military personnel introduced it in Hawaii and elsewhere. More delicious Hawaiian food to learn about and and make: Hawaiian Saimin, Loco Moco, Poke, and Shave Ice. Wash rice, stirring with your hand, until water runs clear. Place rice in a saucepan with water; soak 30 minutes. Drain rice in colander and transfer to a heavy pot or rice cooker; add 4 cups water. If you don't have a rice cooker, place rice and water into a large heavy saucepan over medium-high heat; bring just to a boil, reduce heat to low and simmer, covered, for 15 minutes. Turn off heat and leave pan, covered, for 15 additional minutes. Cut Roasted-Seaweed (Nori) in half width wise. Place the cut nori in a resealable plastic bag to keep from exposing the nori to air (exposing the nori to air will make it tough and hard to eat). Cut Spam Luncheon Meat into 8 rectangular slices approximately 1/4-inch thick. In a large ungreased frying pan over medium heat (Spam has plenty of grease to keep it from sticking). Fry spam slices until brown and slightly crispy. Remove from heat, drain on paper towels, and set aside. In a small saucepan over high heat, add soy sauce, sugar, and rice wine; bring just to a boil, then remove from heat. Add fried Spam slices to soy sauce mixture, turning them to coat with the sauce; let spam slices sit in marinade until ready to use. In a small bowl, place some water to use as a sealer for the ends of the nori wrapper; set aside. Using a Spam Musubi Press (see photo below): Place a piece of the cut nori on a plate. Position press on top of the nori so the length of the press is in the middle of the nori (widthwise). The press and the width of the nori should fit exactly the length of a slice of Spam. (Note: If you do not have a musubi maker, you can use the empty Spam can by opening both sides, creating a musubi mold.) Spread approximately 1/4 cup cooked rice across the bottom of the musubi maker, on top of the nori. A special kitchen gadget, known as the Spam Musubi Press (see photo below), is responsible for the proliferation of this treat. It is a special plexiglas mold with the outline of a single Spam slice. Press rice down with flat part of the press to compact the rice until it is 1/4-inch thick (add more rice if necessary). Place a slice of Spam on top of the rice (it should cover most of the length of the musubi maker). Cover with an additional 1/4 cup cooked rice; press until 1/4-inch thick. Remove the musubi from the press by pushing the whole stack down (with the flat part of the press) while lifting off the press. Fold one end of nori over the musubi and press lightly onto the rice. Wet the remaining end slightly with water, then wrap over musubi and other piece of nori; press down on the other end. cut log into 4 pieces. Repeat with the other seven (7) Spam slices, making sure to rinse off musubi maker after each use to prevent if from getting too sticky. Do not refrigerate musubi, as they will get dry and rubbery. * Only use Japanese medium-grain sushi rice in sushi making. It is a medium-grained rice and gets sticky when it is cooked. Long-grained American rice will not work because it is drier and doesn't stick together. I can not verify this, but several web site say Spam Musubi was created by Mrs. Mitsuko Kaneshiro. She first made it for her children. But then she started selling them out of a local drug store in Honolulu during the 1980s to make some money.